My first GPS experience was the purchase of a Garmin GPS III Pilot in 2001. I didn't use it as much as I would've liked, because I tended to perform flights in the local area, which was very familiar to me. I initially secured the GPS to the cockpit fairing (with lots of tape!) but this proved to be too far away to be able to read the display effectively. A yoke mount was purchased for some inflated sum, but it did improve the useability of the GPS. I used the GPS mainly as a track logger, for use after the flight to plot the actual route on a package such as Microsoft Autoroute. More recently I have used the GPS for real, on a route from Stapleford to Duxford and return. 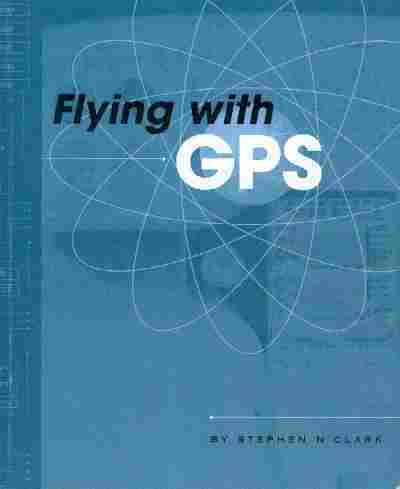 I found the book Flying with GPS by Stephen N Clark a really useful source of information for using the GPS in a real world, flying environment. It goes beyond what the Garmin user manual provides; it even takes a step backwards to remind you of the theory (such as the 1 in 60 rule) so that you appreciate what the GPS will do for you, but also realise the limitations. Another plus point for the book is the UK bias. So many flying books, being written in the U.S., tend to have a U.S. bias for place names and procedures. 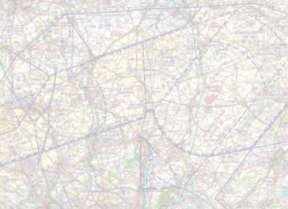 Flying with GPS has example flights for the UK, such as Compton to Kemble. The book is quite specific to the Garmin range (GPS 92 / GPS III Pilot / GPSMAP 195 / GPSMAP 196 / GPSMAP 295. I can't comment on how useful it would be for non-Garmin users, as I have no experience of other types. 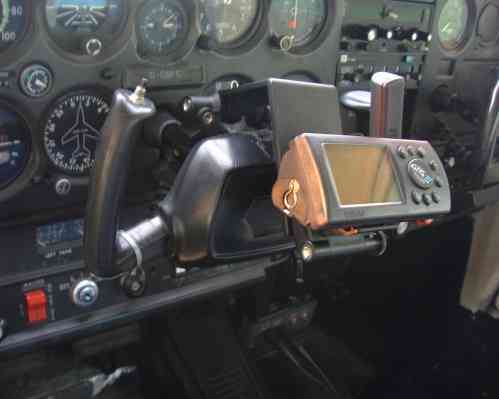 The photo on the right shows the GPS attached to the yoke mount in a C152. There is some debate on whether or not an external aerial is required for reliable GPS use. Flying a club Cessna 152, I have not found the need to use an external aerial when flying around southern England, although I haven't got a huge amount of experience with it. The yoke mount attaches quite quickly, although care must be taken to ensure it is securely located. ALWAYS CARRY OUT YOUR "CONTROLS - FULL AND FREE MOVEMENT" checks after fitting the GPS. The mount is adjustable at several places; make sure it does not obstruct your view of the aircraft instruments. I switch on the GPS just before engine start. I consider this to be OK given that the GPS operates from batteries. If it was powered directly from the aircraft systems, it would be far more prudent to leave it until after engine start to minimise risk of damage. Switching it on before engine start allows enough time for the unit to initialise position so that the activation of the route takes place just before taxi. At the end of the flight, I switch off the GPS just before engine shutdown.